We arrived at the Lincoln showground and were greeted by Robert and Bridget, this was their first time as Marshalls. Most of the SMOC contingent were arriving either Thursday or Friday, with some newbies attending as well. Robert and Bridget gave us our welcome packs which contained a quiz about Lincolnshire and a sheet with funny images which we had to add captions to. The weather forecast for the first night was for some wind and rain….. mmm we woke up in the early hours by the wind howling, we looked out the motorhome window to see poor Bridget and Robert struggling to get their awning down before it took off. We clambered out and assisted best we could to grapple it down and it didn’t take too long before we could go back to our cosy beds and be “gently” rocked to sleep. After the first night’s fun the weather was mainly warm and pleasant for the rest of the weekend. It was great to meet everyone at the get together on the first evening hosted by Robert and Bridget, made extra special as we had homemade cakes prepared by the lovely Bridget.. yum yum. On Saturday everyone had the chance to go into Lincoln by coach for a small fee, great shopping and a chance to have a walk around Lincoln Cathedral and Castle with all the history surrounding it. If you wanted extra exercise you could walk up the very steep hill to Lincoln Castle and visit the little market on the way up to the Cathedral with its range of local produce. The visit also provided a chance to fill in Bridget and Robert’s quiz sheet on Lincolnshire general knowledge! It was surprising how many people from the club we saw wandering around the City, either going for coffee, having lunch or just having a general meander about. 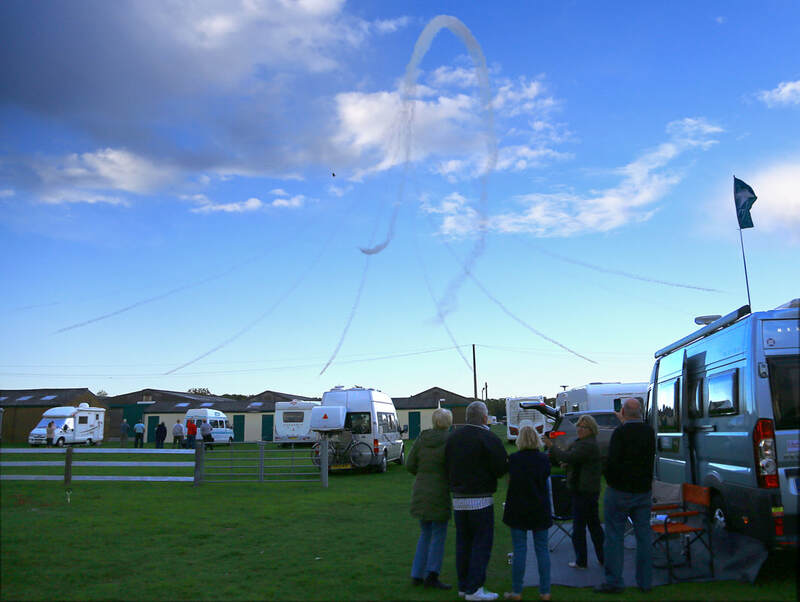 We were treated to the famous Red Arrows from RAF Scampton coming over the showground and had opportunity to take lots of photos as they practiced their amazing show routines overhead. On Sunday we had a fantastic fly past from a Lancaster bomber flying really low right over the showground, it was really wonderful to see. The Lancaster bomber PA474 is only one of two Lancaster aircraft still flying, the other aircraft is in Canada. Each morning during the show there was line dance tuition for those dancers among us, which seemed very popular. Each evening there was plenty of choice of music as there were three music venues each catering for a different genre of music. Thursday evening featured Steve Hanks a country artist and who had also appeared as an extra in Heartbeat, Coronation Street and Emmerdale. On Friday Lee Pashley performed as Robbie Williams, putting on a pretty good show and covering lots of Robbie’s popular songs. Saturday night featured a Beatles John Lennon tribute which was packed out and was apparently very good. The main marque venue headlined with Joe Pasquale and although this was an extra ticket show, a few members went to this and really enjoyed the performance. This was then followed by “Katrina of the Waves”one of the few women from the 80’s still performing and recording, she was the original Katrina from “Katrina and the Waves”. win some great prizes, even though one person had an uncanny monopoly on having the winning tickets…. how embarrassing was that! Still the person not to be named ensured other SMOC friends had the chance to win something, although we do still have the port to enjoy at the Christmas Rally. Robert and Bridget did a fantastic job of looking after us all as Rally Marshall’s – thank you to you both and can we have cakes next time please?